No, it isn’t. Bitcoin isn’t legal tender anywhere and it never will be any more than Avios will be (and I’ve bought more cups of coffee with Avios – one – than I’ve ever bought with Bitcoin). Sorry to be a spoilsport again, but to the very best of my knowledge, Bitcoin is not legal tender in any country. Nor, I would wager, will it ever be. Legal tender is an outdated and essentially meaningless concept, which is why I am baffled by the continued discussion of it. I hate to spoil the joke but Scottish banknotes are not legal tender anywhere, even in Scotland. In fact, Bank of England banknotes are not legal tender in Scotland either, because Scotland (which has a separate legal system) has no legal tender law although bizarrely (and thanks to Colin Platt for this via Twitter) Royal Mint coins are legal tender in Scotland in thanks to the Coinage Act 1971 (Section 2). No legal tender notes! Oh my goodness, it must be chaos! Actually, it isn’t. I’ve been to Scotland several times and I’ve often seen Scots buying things in shops using banknotes, cards and mobile phones. So not having legal tender laws does not seem to be much of a barrier to trade. This shows how uninteresting the issue of “legal tender” really is in the modern age and for decades I’ve tended to assume that any article, tweet or LinkedIn comment that talks about making a digital currency legal tender is written by someone who doesn’t really understand either topic. I do mean decades, by the way. If I cast my mind back to 2006, I can remember writing one of my first ever blog posts about the Snap Cafe in Georgetown, Washington D.C. This particular establishment had attracted my attention because it had decided to stop accepting cash. This is commonplace for forward-looking eateries today, but then it was a revolutionary act. As I reported at the time, the owner said that it had saved her time and money, meant she didn’t have to go to the bank any more and (most importantly, I suspect) didn’t have to trust staff she didn’t know. That point about trust is a recurrent theme in surveys of retailers and cashlessness: even if they perceive cash to be cheaper than electronic payments, cash has a tendency to evaporate. There was discussion around that time as to whether it was legal to do this, since Federal Reserve Notes (ie, greenbacks) are legal tender in the U.S.A. 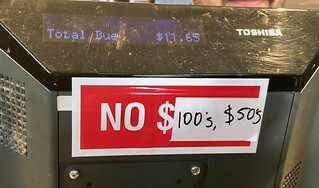 So, people said (incorrectly) that the cafe owner could not refuse them, and some outraged comment asking whether it was legal to ban cash from an establishment ensued. Some time later I remember an interesting clarification of the subject of legal tender in a useful paper on Payments and the concept of legal tender by Nick McBride, Legal Counsel, Reserve Bank of New Zealand. The paper described something else that happened many years ago when the coins in New Zealand changed. The new coins were introduced on 1st July 2006. For a period of three months, the old coins were circulating in parallel with the new, but some retailers put up signs saying that they wouldn’t accept the old coins. This, presumably, was because they didn’t want the hassle of having to bag them all up and take them to the bank to swap for new coins. So… could retailers refuse to take the old coins in payment even though they were legal tender? The answer in both cases was that retailers can refuse to accept legal tender. Wait, what? So what’s the point of legal tender then? Well, the point of it is that you cannot force a retailer to accept legal tender (or indeed any other form of tender). If, however, you buy something from them and there is no contractual barrier to the use of any form of tender, and you offer legal tender in payment, and they refuse it, then they cannot enforce the debt in court. That’s what legal tender means: it’s about discharging debts. If you incur a debt you can discharge it with legal tender, but you cannot be forced to incur the debt in the first place, if you see what I mean. Another linked story from many years ago was in Techdirt. Apple were refusing to accept cash for iPhones and insisting on credit cards. They had a link to the relevant U.S. Treasury page to explain the score to outraged citizens. In the U.S. there is no Federal statute mandating that a private business, a person or an organization must accept currency or coins as for payment for goods and/or services. Similarly, in the U.K. where only coins valued 1 pound Sterling and 2 pounds Sterling are legal tender in unlimited amounts you cannot force Apple or anyone else to accept them. They are free to enforce any conditions they like (within the boundaries of the law) with customers. When you buy a coffee from the coffee shop, you are entering in to a private contract. (Our good friend Leo van Hove made a very good presentation about this, called When Will Electronic Money Be Legal Tender? at Consult Hyperion’s 7th annual Forum). Euro notes and coins are legal tender and retailers can only refuse them for reasons of “good faith” (for example, the retailer has no change). No surcharges should be imposed on cash payments. Banknotes stained by the Intelligent Banknote Neutralisation System (IBNS) remain legal tender but should be returned to national central banks (as they likely come from a robbery). Retailers must accept 1 and 2 eurocent coins in payment. Sensible policies for a better Eurozone, you might think, but you’d be wrong. The essence of these recommendations was that shops will be forced to accept €100, €200 and €500 euro notes and 1- and 2-euro cent coins. Why? Well, because in many countries the shops don’t want them. In some countries (eg, The Netherlands and Finland) the retailers and the public seem to have, in a decentralised fashion, decided to abandon the 1- and 2-cent coins. They are nothing but a hassle and do nothing to assist commerce. At the other end of the scale, retailers in many countries will not accept high-value notes, partly because they don’t want to make change and partly because they are worried about counterfeiting. After all, if you are a corner shop and you get stuck with a bent €500 note then you are €500 out of pocket: the ECB won’t take your counterfeit note and give you a new one. It’s worth paying a few cents to the bank for a debit payment to avoid that risk. Anyway, apart from people like me, Professor van Hove and the European Commission, no-one much cared about legal tender one way or the other for years after the recommendation until Bitcoin came along, at which point the phrase became rather common. Almost everywhere I see, however, it is being misused (as I hope I have demonstrated). By all means please continue to use it, but please do read up on it first. Legal tender does not mean what you think it means. I once had lunch with Italian anti-euro nationalists. 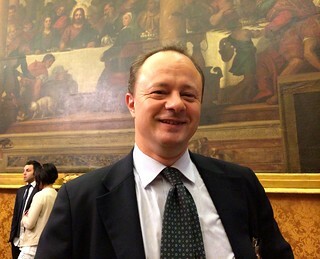 They had invited me because I was in Rome to give evidence on cryptocurrency to a committee in the Italian Parliament and they wanted to ask me about parallel and complementary currencies (yes, really). 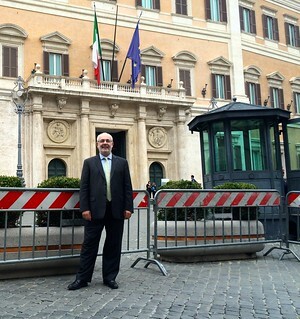 Here I am in from of the Italian Parliament building, Montecitorio, for the public hearing. My host for this day was Geronimo Emili (below) from the “War on Cash”. I won’t go into the discussions — they have been covered elsewhere (e.g., here) — but I focused my contribution on the radical and innovative nature of the Bitcoin protocol while remaining sceptical about the potential for Bitcoin as a currency (although I did support the idea that new kinds of currency are around the corner). I think the past four years have reinforced my summary comments to the hearing, which were broadly that Bitcoin is a genuine technological breakthrough and it will cause a revolution, but probably not in payments. After that, it was off to lunch with (if memory serves) the Deputy Leader of one of the political parties that was in favour of more autonomy for the North. We had a very interesting conversation – through a translator – about the potential for new technology to make regional and city currencies a practical possibility. I’m rather in favour of having more currencies and particularly more currencies that are more closely linked to the values and needs of communities. There is a general argument in favour of a regional approach to currencies in a mobile-phone powered always-on digital age. I first heard it clearly expressed by the late Sir Richard Body MP. Sir Richard was a noted eurosceptic, supporter of an English parliament and, rather famously, one of the “bastards” referenced by John Major. He was also very interested in the theory and practice of money and at the second annual Consult Hyperion Forum (back in 1999) he gave an eloquent explanation as to why regional currencies with floating exchange rates would lead to more efficient resource allocation and more beneficial resource distribution than government transfer payments do. I think I may have mentioned this at lunch. Although I thought no more about it at the time, it looks as if I may have inadvertently conspired to destroy the euro, as I now read that the anti-euro Lega nationalists and the alt-Left Five Star Movement are planning to go around the euro and create a rival payment structure based on ‘IOU’ notes. This would subvert the monetary control of the European Central Bank and might well set off a chain reaction in Catalonia, Scotland and perhaps even London.